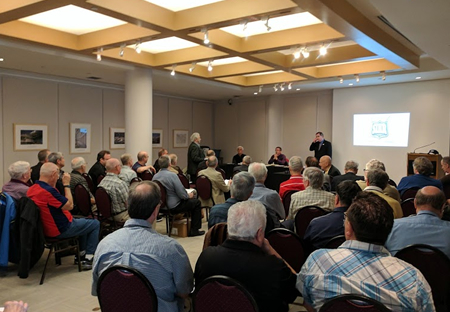 The Society partnered with the Canadian Museum of History to hold its 2017 annual general meeting in Canada's Capital Region. Members congregated amid the celebration of Canada's 150th anniversary, the 125th anniversary of the Stanley Cup, the 100th anniversary of the National Hockey League, the 50th anniversary of the Ottawa 67's, the 90th anniversary of the Senators last Stanley Cup win and the 25th anniversary of the modern day Senators Hockey Club. 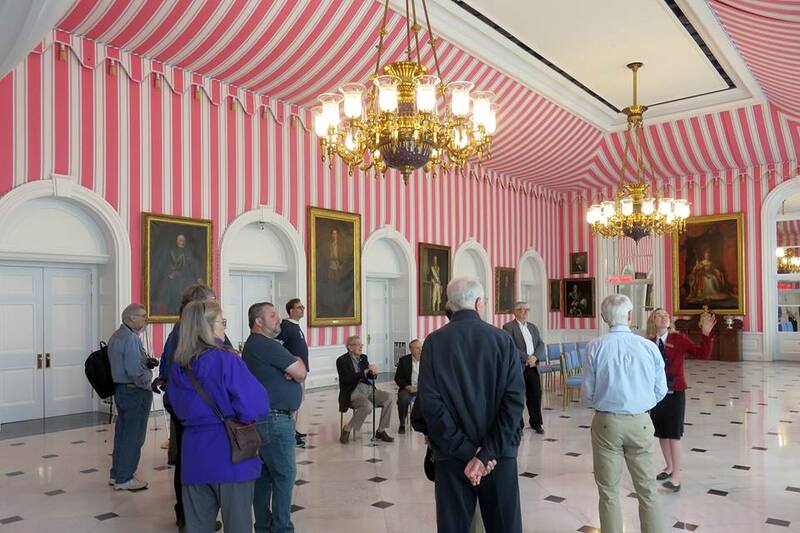 The weekend's activities got off to an early start on Friday afternoon, as nearly 60 members visited Rideau Hall, the official residence of Canada's Governor General, His Excellency the Right Honourable David Johnston. 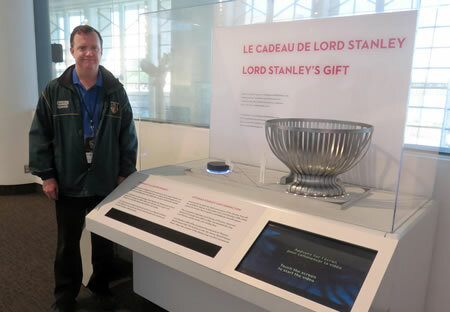 Guides made an effort to highlight the connections between hockey and many of Canada's vice-regals over the years, including the historic skating rink created by the Earl of Dufferin in 1872, and the famous trophies donated by Lord Stanley and The Right Honourable Adrienne Clarkson. The spectacular views of the Ottawa River and the Canadian Parliament Buildings were the backdrop of the Meet & Greet held at the Panorama Lounge of the Canadian Museum of History in Gatineau, Quebec. 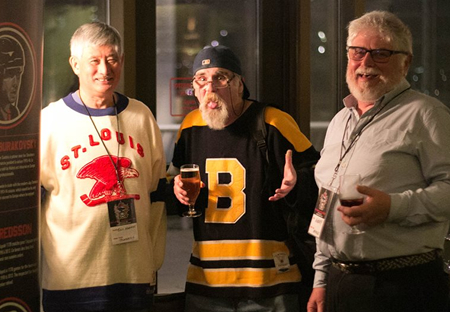 Members enjoyed hors-d'oeuvres and drinks as they socialized and compared hockey jerseys and sweaters. 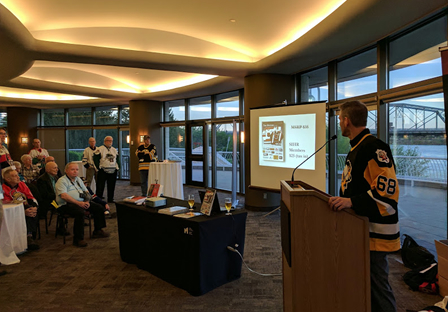 New member Chris Delorme, author of the book The History of the NHL Hockey Jersey, as well as forthcoming versions for the Ottawa Senators and the Pittsburgh Penguins, entertained the group with a presentation about many of the pieces he has seen while documenting collections. 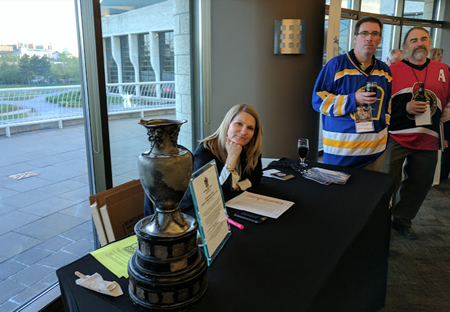 Also on hand was the Championship Trophy of the Lower Ottawa Hockey League, which was originally awarded in 1901, and had been lost to time until it was recently uncovered by reporter Bruce Deachman. 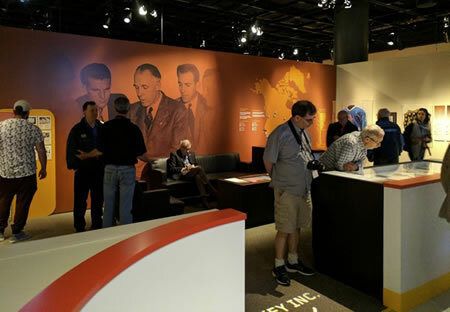 A beautiful spring morning greeted members as they arrived at the Canadian Museum of History for the Annual General Meeting in the Douglas Cardinal Salon, just off of the majestic Grand Hall, a spectacular space housing the world's largest indoor collection of totem poles. An abbreviated business meeting featured reports from outgoing President Jean-Patrice Martel, who also delivered the report of Treasurer Iain Fyffe, followed by membership manager Lloyd Davis. Martel also announced the election results, and the group congratulated the incoming President Wayne Geen, as well as winning incumbents Waxy Gregoire and Ed Norris. 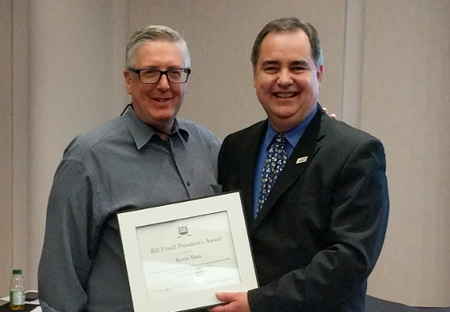 The annual award winners were announced, which saw Kevin Shea win the Bill Fitsell President's Award for outstanding contributions to the Society. The Paul Kitchen Award for best book or documentary research project produced during the past calendar year went to Howard Shubert. Author Todd Denault won the Brian McFarlane Award. President Martel also announced that the fall meeting will be held in Montreal on the weekend of November 25 and 26, to celebrate the 100th anniversary of the founding of the National Hockey League in that city. Stay tuned for more details. The AGM was the last one presided over by Jean-Patrice Martel, who stepped down after nearly 5 years of dedicated service. He was instrumental in many initiatives, most notably the revised Constitution, electronic voting, and an increased presence within the French media in Quebec. Bravo JP! 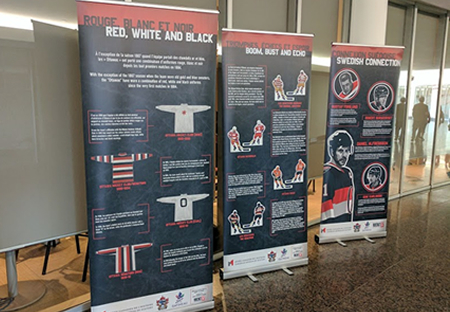 The first presentation, titled Origins of Canadian Hockey: A Missing Link - The Mi'kmaq and "Two-Eyed Seeing" was by Dr. Paul Bennett, who delivered an engaging perspective on the game's roots. Next up were former Ottawa Senators players Jim Kyte and Laurie Boschman, who participated in a moderated discussion panel, in which the two former teamates with the Winnipeg Jets and Senators, recounted many great details about their careers and lives. Afterwards, the pair graciously signed autographs and chatted with members over the lunch break. 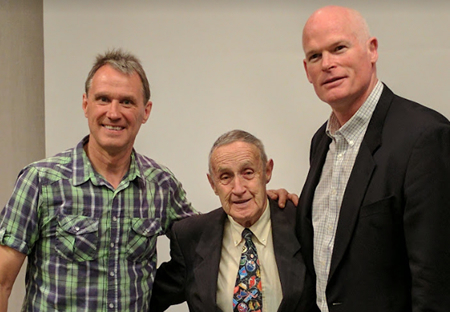 Following an introduction by Howard Morenz III, Dean Robinson recounted the story behind how his 1982 book on Howie Morenz came to be, and the many legends he met with and interviewed on weekend road trips while doing his research. Fred Addis presented Don Gallinger: Hockey Pariah, the story of the Port Colborne native who made the impressive leap from Jr. B to the NHL at age 17, but was suspended indefinitely for gambling and was never able to resume his career. 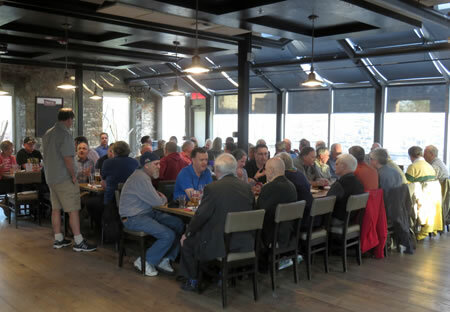 Forecheck, backcheck, health check: the benefits of playing recreational ice hockey for adults in Canada was the topic of Peter Kitchen's presentation. Conclusion? Keep playing! 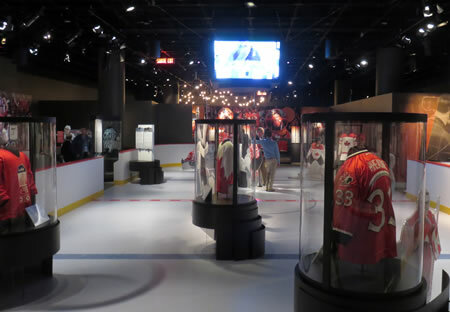 Mike Fisher of Denver, Colorado, who isn't married to Carrie Underwood, presented Exploring Hockey's Evolving Landscape, which showcased an interactive history of professional hockey. See it at hockeyscape.ca. 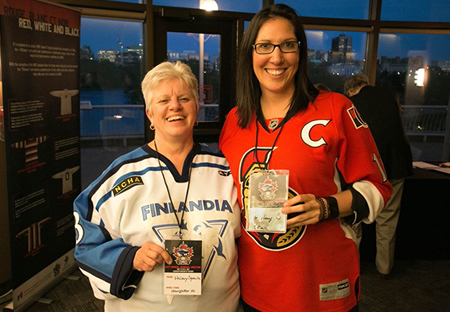 After the presentations, the group was joined by Jenny Ellison, the curator of the Canadian Museum of History's special exhibition Hockey, who explained the motivation and process involved in creating an inclusive, diverse and representative exhibition which captures the spirit of the game and the fan experience. She then led the group into the exhibition and highlighted some of the key pieces and popular artifacts. 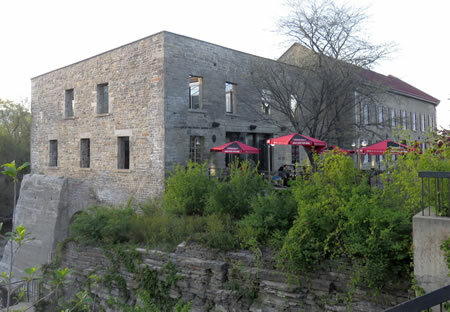 Following the meeting, a group dinner was held at the picturesque Mill Street Brewery on the Ottawa River, where many a tale of hockey were told and the pints were cold. A small but receptive audience greeted the presenters at our public event held on Sunday. Jean-Patrice Martel, Benoît Clairoux and Kevin Shea delighted the group with presentations on the NHL prior top the "Original-Six", table hockey and Lord Stanley. 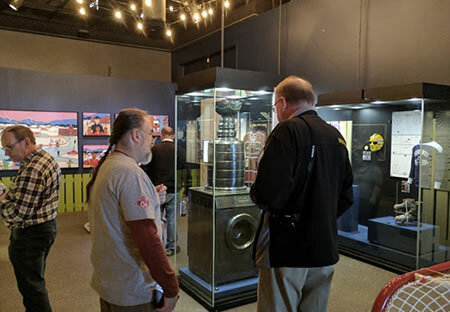 The group was also joined by museum staff members Jenny Ellison and Dominique Savard, who led the attendees on a tour of the hockey exhibition following the presentations.